Depending on accessibility, localized or “spot” treatments are perfect for exterminating isolated infestations of termites. After a complete inspection of your home is completed, a termite inspector will recommend the best type of treatment for your home or office. AmeriGuard offers both full structure tent fumigation as a primary recommendation or secondary alternative treatments should termites be directly accessible. There are several alternative methods of localized termite spot treatments including: transferable termiticides, residual termiticides, borate treatments and foaming agents. In certain situations, such as controlling Subterranean termites, drilling and treating or rod and trench applications of repellent termiticide barriers are the only choice for continuing control. Repellent termiticides provide form a repellent barrier which prevents termites from entering the structure. 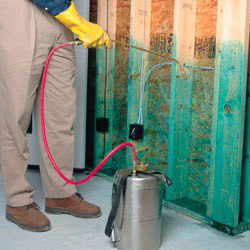 There are several secondary treatment options for drywood termites. Non-repellent, transferable termiticides allow termites to penetrate treated areas where they contact the active termiticide. 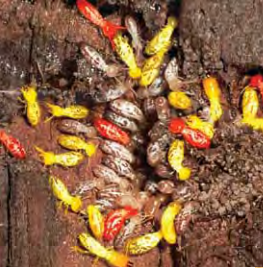 The termiticide is then carried on the termite’s body into the colony, spreading to other termites like a virus. Borate treatments and foaming penetrants soak into the wood members and leave behind residual termiticides, killing the termites. AmeriGuard Pest Defense uses top-of-the-line termiticides, including Termidor®. Only a certified Termidor professional can apply this transferable, nondetectable termiticide that works like a plague effectively killing off the termite colony at the nesting sites. The below image demonstrates the transfer effect of Termidor® including the termites that have come into direct contact with Termidor®, the termites that have come into contact with the affected termites and the termites that have yet to be affected. All termite treatments come with a guarantee.